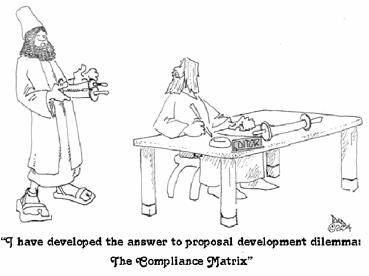 In the age and efforts of a proposal shop, there has always been a disdainful thought of preparing the "Compliance Matrix"! What if I forget something? What if I misinterpret the RFP? And I can list a hundred "IFs" - and they would all be true. This is a program that has been thought of more than a hundred times, maybe even a million times - IF ONLY … Well I can say this software has been living in my system "Things to do" file more than two years since I got back into the proposal game. It is a game, isn't it? And now the time has come to name this child - the E-Z Compliance Matrix Report Generator - may not be the loveliest name in the book- but you all know the child by many nicknames - so why not just call her "The Matrix Report". She is far from ugly, and she will definitely save you money on your proposal budgets. The term "E-Z" is because the owner of the software - me (and my wife) owns the parent company - in which we process our billing - E-Z Stitches, Inc. - a commercial embroidery company. We also sell the E-Z Estimator - an embroidery production control software package. So, or is that sew - we kept the name tag - "E-Z". Need decorated apparel, go to www.ezstitches.com - thank you. When will it do sections L and M? Next year - first quarter of 2005. I'm very busy getting the 2005 version of the E-Z Estimator completed - along with writing proposals for my clients - hmmmm proposals, what a unique industry. How are you able to parse a word document into an Excel file? VERY nicely - that my friends is part of the magic of the software. People have tried it for years, and not too successfully. As I said, it's been done and now it is available for sale. How long would it take you to write "The Matrix Report" from a 30 page section C, the better part of a full day, and maybe with any distractions, two days? Take your daily rate, time 2 and that has to equal more that $700.00…. now do that for all the proposals you have to review, and the answer is obvious - yes - and quickly too. Where did the toons come from? On my last proposal, as we all do, I ran into the master of the toons - Mr. Toadtoon. I relayed my concept, we struck up a deal, and I have incorporated the toons as part of the eye-appeal, and empathetic feeling we all have for compliance matrix reports! Visit his site at www.toadtoons.com - well worth the time for a grin or two. All toons are used with permission. What about the output file? The file "CompMatrix.xls" will be located in the My Documents folder of your system. After you access it with Excel you may save it as any other file. Perform the "SAVE AS" function and rename the file and save the data wherever you prefer. What must be done with the Excel sheet? The file is a pure export of a database. You will have to set the cell parameters the first time through. Word wrap the "B cell. Bold up the key words if you prefer that type of report, add a column or two for addition checks and balances, i.e. Proposal para. #, or Due date back from the writers, etc. This gives you several avenues of customization - based upon your company's specific report formats. Call me - 301-253-3971. This is simple to operate. Read the instruction sheet, and you'll have no problems, but if you do - call me 301-253-3971. In the first quarter of 2005 the new release of the E-Z Compliance Matrix Report Generator will be available. Those who purchased the initial release get this version for FREE. Everyone else will be paying a higher price for the next level. It will be the same simple easy to use software, but with a few more operational features. Stay tuned…. Yes, there is a pricing discount for corporate quantity purchases. Call for details 301-253-3971, or email sew@ezstitches.com subject: CompMatrix Enterprise Licenses. Thank you for the confidence to try something new and exciting. I'm sure you and your company will benefit many times over by using the E-Z Compliance Matrix Software.